That’s Raffi Torres in the image above, yelling at his teammates, “What the bloody blazes are we doing this high in the BTLNHL countdown? !” Because “bloody blazes” seems like something Raffi Torres would say. Well Raffi, it’s because that’s a pretty nice design you’re wearing, and I’m not talking about your tattoos. Like the Canucks in the last post, this logo also features an animal prominently, and again, it’s executed extremely well. The features are toned-down and stylized, the colours are unique and work when creating a logo for a city placed in a desert, and it’s about a 10,000% improvement over the previous monstrosity that they claimed was a credible logo. How much is 10,000% percent? It’s more than the 110% often required from players to win a hockey game. So, yeah, it’s a lot better. But that’s not saying that because their new logo is a vast improvement over their previous joke of a logo allows them to jump up spots (seriously, it would’ve have easily been in 30th place had I worked on this list ten years ago, worse than even the old Mighty Ducks logo). There’s a lot of things to like about this logo and personally, I like the fact that a logo of such quality is coming from a place where you wouldn’t expect it, from the completely non-traditional hockey market. 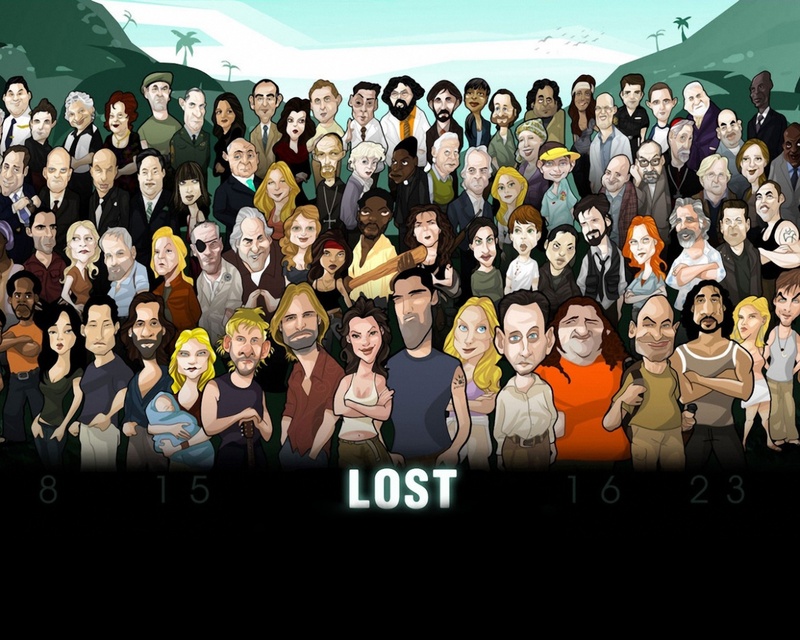 It’s like realizing Desmond is your favourite Lost character. He wasn’t even on the original plane! Gah! Like their previous logo, their current logo draws on native Navajo design aesthetics. But where their previous logo (and horrendous jerseys) took that aesthetic very literally and to its natural extreme, their current logo uses it extremely subtly and with great restraint. If you look at a selection of traditional Navajo artwork, their aesthetic relies on sharp angles and, specifically, triangles. And on the Coyote’s logo, they have a triangle pattern 5 times: on the fur around the coyote’s neck, on the ear, on the squinting pattern around the eye, the teeth and finally, on top of the snout. There’s also single triangle shapes added everywhere: at the bottom of the ear, around the edge of the mouth, inside the mouth, the squinting eye, on the chin, on the black line in the middle of the logo and, of course, the ear itself. It happens too much to be coincidence. There’s more triangles than that really hard level in Angry Birds. It’s a subtle way to pay homage to the artwork native to the Phoenix area. It’s much less obvious than in the Canucks logo, but I’d put down good money that it was intentional. It’s also this consistent motif that makes it such a strong logo. As I’ve said repeatedly in previous posts, designing an animal into a logo for a professional league is no easy task because it’s so easy to let the design get out of hand and too cartoonish. But the consistent triangle motif is a great way to hold everything together, to give the animal some character but it’s subtle enough to not make it over-the-top. The colours, as mentioned earlier, are unique in the NHL landscape as well. Only the Avalanche use something even close to resembling the same maroon colour, but they pair it with blue. The Coyotes keep the desert theme going, matching it with the beige, giving a strong desert-like motif. I know I keep bringing up the Canucks logo in this post, but it’s because they are fundamentally similar logos. And in the Canucks post, I mentioned that Canucks are easily in the top 3 is connecting the logo with the city. Phoenix would be another one in the top 3, and again, that scores major points. For a non-traditional hockey market like Phoenix, that’s important. With their first logo, they tried way too hard. I mean, come on, did you see those hideous third jerseys they rolled out? Come on! It feels like with this one, they got it right. And for a sports logo, it shows amazing restraint in terms of outlines. 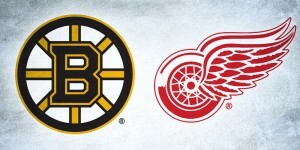 Most of the logos in the league have one, two or sometimes three outlines around their logo. Phoenix has one, and like the rest of the logo, it’s subtle. It’s strong where it needs to be and refined where it needs to be. Strong but refined, just like David Brent. At least in his own mind anyway. So what’s wrong with the logo? Well, we’re heading into the realm of logos where there’s not necessarily anything specifically wrong, but it’s all about the intangibles. Does the logo give the feeling of strength? Yeah, I think so, but I also think there’s generally a mixed reaction. To me, it’s a coyote, so it’s pretty obvious that it’s howling. But it could also looks like it just stubbed its toe (and it’s not Superman). Or in the process of sneezing. Or should be included in a famous painting. Is it a strong hockey logo? Meh. Hockey logos don’t necessarily need to have anything hockey-related on them, but this logo seems designed to be more geared to connect to a generally uninterested market, so it’s understandable why they went that direction. But overall, it’s a well-refined, strong and well-executed logo that speaks to the area it represents, and worthy of being one of the top 10 logos in the league. Enjoy this logo (the best in the Pacific Division, by far) while you can, because within months, it could be gone and replaced as the Quebec Nordiques or the Seattle Totems. Once again, I was unaware of the Native motifs in the logo. I’m convinced, and I also agree with its placement above the Canucks. Once again, in a hockey aesthetics debate, I’m going to stand up for the original Anaheim Mighty Ducks (Mighty Ducks of Anaheim?) logo. I understand the hockey traditionalists’ argument about the Disney connections, the cartoonishness, etc. But where do they play? They’re catering to an LA/Hollywood market. And in a lot of ways, their look made them instantly recognizable—if I recall correctly their merchandise sales soared in the spring of ’03. Formally speaking, the colors are without a doubt distinct, the logo is bold and worked great in the context of the jersey. Quite literally, it says, hockey, mighty, and ducks. Then the movie tie-in does homage to SoCal. And I think it’s safe to say that whatever your thoughts on the original, anything would be a step up from their current logotype. Had the Ducks kept those jerseys, they might have had some good brand equity built up but now it seems they are near the back of the pack in that category among the expansion teams of the 90’s and 00’s. So that’s my impassioned defense of the Paul Kariya-era Ducks look. 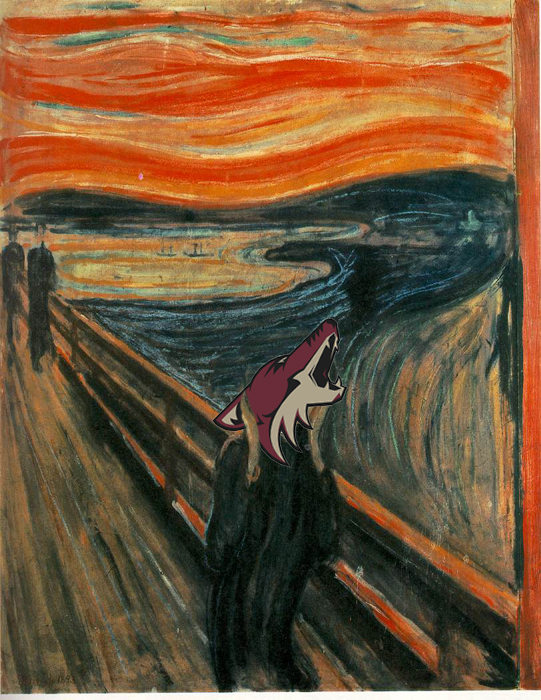 …Also, nice thoughts on the Coyotes. An excellent defense. I totally believe you that the merchandise sold incredibly well, but I don’t think that necessarily makes it a great logo. Like the Sharks who had tremendous sales in their first couple years, I don’t think it automatically means it’s a great logo from a design perspective. But yeah, I might be too much of a traditionalist, but that’s my general bend. I think I’m just disgusted with where the logo naturally led, which was to jerseys like this one: http://sjsharkie.dagnabit.org/hoser/wj-ana.jpg Just awful. But, there’s a good blog post in there somewhere, about the old Ducks logo! I’m going to totally disagree with you on this. And we’ll just have to agree to disagree. You make some interesting points from a design and art perspective. I’m not an artist, though. And I don’t really care about the little triangles in the coyote head. I never noticed them before. I seriously dislike this logo. To me, it doesn’t say “hockey.” No, it doesn’t have to have a hockey stick in it. I agree with that. But like you put it in a classic piece of artwork, it just does not look like a logo. I also don’t like the balance of the logo. With it on the sweater, I feel like it’s very lopsided to the right. 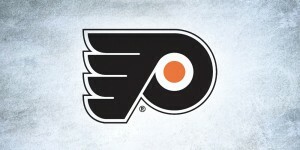 I prefer logos that are more symmetrical and fit squarely in the center of the jersey. I also don’t like the colors. I’m tired of the southwest teams coming out with these invented desert red colors (Houston Astros, Phoenix Coyotes, Arizona Diamondbacks). They’re gross. I’m glad that I’m not a fan. I actually do prefer the original Coyotes’ logo. Is it the best? Ok, no. But this dumb coyote head isn’t so special as a sports logo. Sorry. 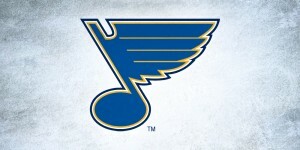 I agree with it not necessarily being a hockey logo, and that’s why it’s ranked down at #9, and not higher. Otherwise, yes, I’ll agree to disagree. I didn’t know about the Native inspired design before, but I still liked it. Their logo is clean, and the colours are great. Their jerseys are actually my favourite ones that doesn’t belong to a Original 6 team. Maroon and white looks great together. The only real reason I hope the Coyotes stay in the desert is because I would really miss their jerseys and logo. They don’t get the appreciation they deserve. 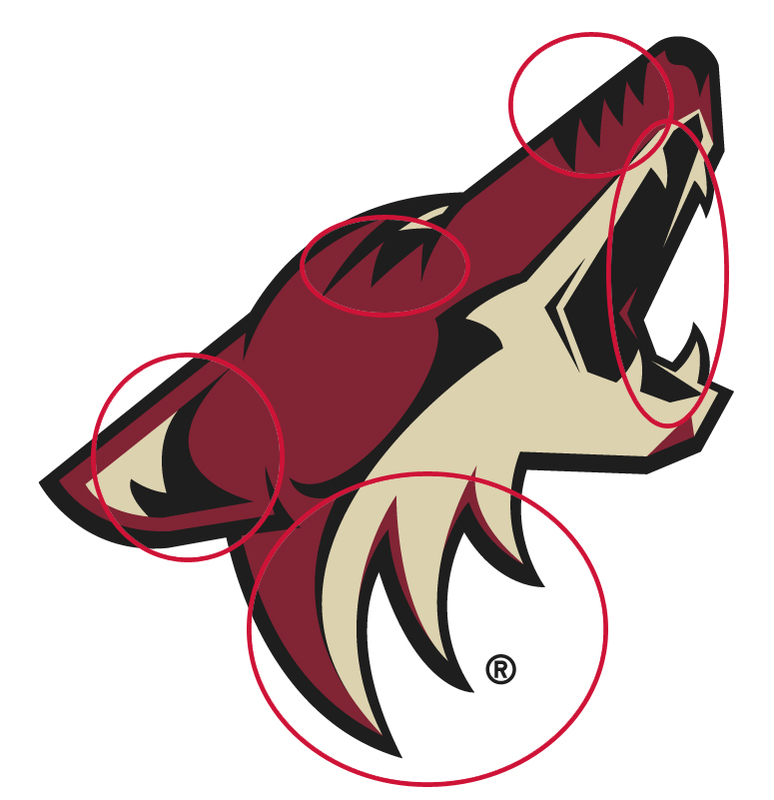 As a Coyotes fan and an artist, even I couldn’t decipher there was a motif behind the recurring triangular designs. Definitely a neat sub-story in the logo. I’m curious on your opinion of the alternate logo on the third jerseys which pulls off the full body leaping animal look without looking extremely busy (See: Panthers, Florida). I’m not really a fan of the alternate Crescent moon logo or the wordmark (cursive font + triple outlines = yuck) and I can take or leave the shoulder paw-print logo. But they definitely hit the main logo right on the button when they did their redesign.